An intention, for me, is an anchor for how I want to live my life. I envision that by following the Moon’s phases and orienting myself to the signs and seasons of the Sun, I am able to find the timely anchor for living a life of mindfulness, joy, and meaning. I am looking at a list of transits for this week, which are many and dynamic, and am noticing that it may be hard to keep hold of this anchor. What happens when you are derailed from living into your intentions? Many of us may be challenged to keep to our centers and intentions not only this week but during the entire Spring. It is good to think about how we cope, react, and judge ourselves in the face of needing to respond to new input. I am putting my faith in the idea that in spite of sometimes seeming to lose track of my intentions, because I declare them in the sacred darkness of the New Moon, they still exist and make a difference in how I ride the currents. The planets are buzzing with interconnectivity this week! Most planets, all but Neptune (and even Neptune is pretty close), are traveling through a narrow band of degrees—between 6 degrees to 11 degrees of their current sign. This means there are lots of aspects between planets. Aspects are connections; each type of aspect carries a different energy, some challenging, some harmonious. With so many connections being made a certain amount of unpredictability occurs. There are so many variables. Longstanding pressure could be released. Like firecrackers waiting for a match, any one of the quicker moving planets may touch off a chain reaction that could rapidly move through these connections. If we imagine the planets as quietly keeping to themselves this Winter, they suddenly have a lot to say and all at once. That’s why I think it may be hard this month to remember the dreamy, interior intentions of the Pisces New Moon* of March 11. By the Full Moon this week, we are already in the thick of coping with quick changes. These changes can be welcomed but may also be disorienting. Remember that anchor of intention? Even though the anchor may not be visible, like a dream it still walks with us as we take this journey to our own becoming. Sunday, March 24. The Moon in Virgo presents us with a test. Do we choose to focus on perfectionism or on progress? In the current Gibbous phase of the Moon, it is easy to get caught up in judging imperfections. We get to practice shifting our perspective today from self-judgment to self-congratulation. That will be progress indeed! The balance between pragmatism and idealism is a great place to start in achieving a balanced life. Monday, March 25. How are you feeling stretched? The more pressure we are under, the easier it is to snap. Perhaps the biggest change we could make in the face of internal and external pressure is to stop believing the lie that somehow it is our fault. Systems need to change and we can ready ourselves to become the co-creators of those new systems if we dare to think of ourselves as the solution not the problem. That desire to live a joyful, authentic life is a wonderful guide. It is time to notice the various components of what we desire. Not everything makes logical sense but all the pieces are important. Tuesday, March 26. The aspects today could be incredibly exciting, vibrant, and revelatory. And they could be dramatic and scary—much like the image of the Tower card in a Tarot deck is exciting and scary. This is one of those days to give our passions wide berth. Lightening wants to strike. We can make good use of this power if we are willing to let go of resistance to what needs to change. There is a tide of transformation moving through the world. How do you wish to engage with this force? With the Moon moving into Libra, we seek to balance this energy through relationship. Even those relationships that are going through some rocky places are teaching us something important. 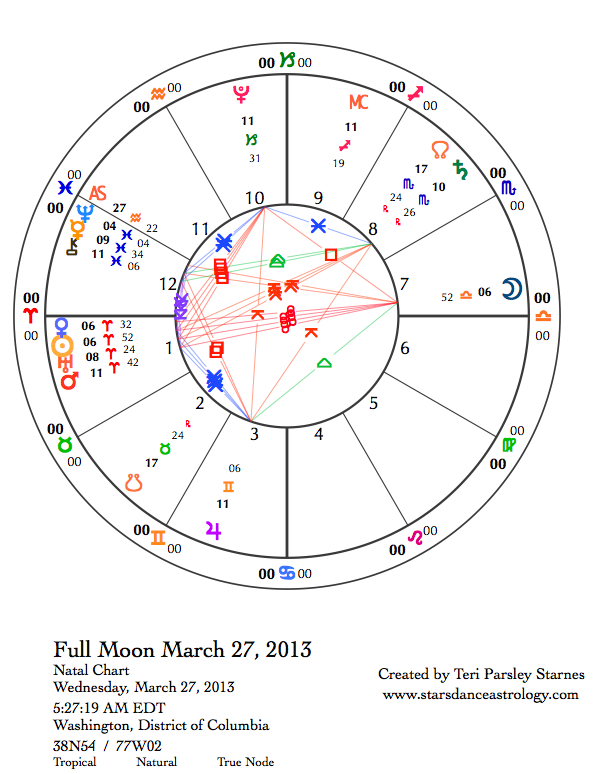 March 27—Full Moon: Illuminating. Before 1pm** today, the Moon makes six aspects to other planets. This fact is just one way to frame the volatility of this Full Moon day. The illumination comes from the spark of Aries fire igniting action and reaction in so many arenas of life: our relationships (Venus in Aries), our egos (Sun in Aries), our quests for authenticity and freedom (Uranus in Aries), and our wills and passions (Mars in Aries). So much change is possible! One key to using this energy is to dare to be a little more vulnerable. Take a risk, initiate something new, move your body, and be willing to not know where it will take you. Aries energy is often compared to the Fool card in the Tarot. With a sense that we have nothing to lose and everything to gain, it is time to begin an adventure. The Moon in Libra gives a counterbalance to Aries’ drive to more fully know who we are. Opposing signs form a partnership of wholeness. We are not on this journey alone, even though it takes an act of personal daring to get going. Relationship helps us to moderate our impulses and become accountable for our actions. The squares from Pluto to the Moon, the Sun, and the three other Aries planets in the Full Moon chart, show that powerful issues will be addressed through the balance of impulsivity with accountability. This isn’t a time to hold back, but can be a good time to return to the anchoring intention of this lunar cycle. Two Yod aspect configurations in this chart point to a time where not everything falls into place easily. We are being challenged to incorporate new information or other points of view that could create dissonance with what we thought we knew. This means we are learning a lot right now, especially in the realms of mind, action, and heart. Cherish complexity. The square between Chiron and Jupiter attunes us to the suffering of others. It feels huge to be aware of so much need. We can be grateful for the fires of action but release expectation that solutions will be immediate. Thursday, March 28. In spite of a day that has the potential for many unexpected events, underneath it all we feel that we can make progress towards a satisfying goal. Mercury in Pisces is trine Saturn in Scorpio. The recent Mercury retrograde period is now coming to completion as Mercury aspects planets for the third time in this cycle. Now, we integrate Mercury’s lessons. Perhaps this will help us feel more confident about our skills of intuition, empathy, and dreaming. Perhaps we will also feel that all the miscommunications, technical difficulties and just plain old confusion of the last few weeks will have been for a good reason. There are mythic tones to the day. Venus, the Sun, and Uranus come together at 8 degrees Aries. Venus has disappeared into the rays of the Sun. The myth associated with this astronomical event is Inanna’s visit to the underworld. This Sumerian goddess turned away from her power as Queen of Heaven to visit her sister Erishkigal who was midwife for the dead. Because of this journey Inanna was reduced to a bag of bones. No one could understand why such a powerful goddess would do this. We can take this journey ourselves. What might we receive? With Uranus involved, the gift may be the readiness to let go of anything that keeps us from our authentic selves. Friday, March 29. If you’ve lost connection to your New Moon intention over the last couple of weeks, Mercury may help you retrieve that felt connection to heart and dream today. Be grateful for emotional awareness that creates empathy and also tells us when we need to take time for ourselves. Recently, life may have felt larger than life. Let all that sink deeper into your soul and make it welcome. Moon enters Sagittarius 10:13 pm. 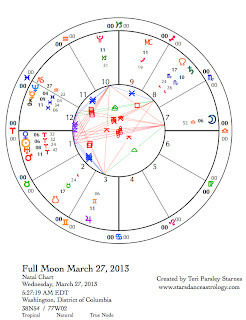 March 30—Disseminating Moon: Sharing. The practice of gratitude can be such a tonic. Whether we are feeling joyful or overwhelmed, gratitude is a great way to even things out, make the good more lasting, and make the fearful more doable. This phase of the Moon is a wonderful time to practice gratitude regardless of what is showing up for us. Make a list. Think back over this lunar cycle that began on March 11, what are you grateful for? This is what we also have to share. We are reaching for truth and big understandings right now. We’re being asked to stretch in many new ways. What keeps you grounded and what keeps you reaching? *To follow along with the development of this lunar cycle read the New Moon forecast for March 11. Very enjoyable and so helpful to be at least somewhat prepared.....Thanks so much!